Do you know that Japan is a huge importer of water? Two tons of water is required to produce beef for a bowl of Gyudon (Beef of Rice). As you live in Japan, one of the largest importer of both food and water, you will witness rapidly growing problems in shortage of water resources for food production, and thus serious food crisis. 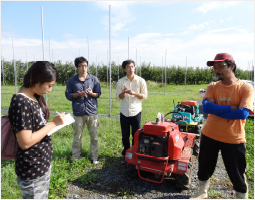 By learning Japanese situation of food and agriculture, you can opine for future directions struggling hunger and environmental problems of the World. 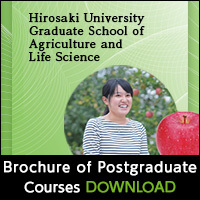 In the national leading food production base of Northern Tohoku region, you can study natural sciences, agricultural technologies, farm management and economics from basic to practical aspects. Our education goal is to give students a strong, multifaceted, comprehensive and practical knowledge of a wide variety of food productions, from fruits to farm produced food, vegetable, herbs and farm animals to farming machines from a production area’s standpoint as well as the financial management that the goes with the sale of said things. 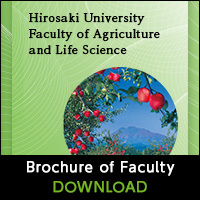 We study both the theory and practicality of Agriculture and Food, two things that are greatly connected to the future of our world and humanity. A solution to the problem of agriculture and food moves regions and the world. Our education target is as follows. We bring up the ability that can grasp a problem over management, economy and marketing of food and the agriculture from a viewpoint of natural science and the social science generally. We study theoretical knowledge about the improvement of farming and the agricultural and livestock products marketing, and we bring up ability to apply them practically. From the economical problems of agriculture and food, we study how to best go about agricultural and regional vitalization in the future.